The proposed development of an extension to the Greenbank Hotel will obviously increase traffic along North Parade, Tehidy Terrace and Stratton Terrace. However, it is the impact on parking which is likely to be the much more significant problem. The developers state in their planning application that "... 53 additional parking spaces will be provided", apparently implying that this will ease the existing problems of parking in this area. This is not the case - all the increased parking provision will do is to allow one more car parking space for each proposed room, suite or apartment - and it is to be assumed that most guests will come by car. In fact, the hotels own parking provision may become worse, as over the past few years many hotel guests have come by coach, allowing a large group of guests to arrive together in one vehicle. If the hotel is as it says to be upgraded to a four star boutique or destination hotel it is extremely unlikely that coach tours will form a large part of their clientele, and even more pressure will be put on parking, as a higher proportion of their guests arrive by car. At present there is off-road parking provision for one or two coaches. This will vanish if the development proceeds, and if a coach needs to park it will have to do so in the new parking area to be developed. The developers have made much of the fact that 53 additional car parking spaces would be created in the plans. In fact these are actually less than the number of bedrooms in the new extension, and the developers have not said anything about the fact that lurking amongst the approximately 200 documents submitted with the plans, is the one (helpfully entitled Env Statement Appendix 11.6) that shows that a medium sized truck would be unable to turn both ways out of the car park exit without coming within inches of the raised paving on Stratton Terrace - thus making it almost inevitable that existing public on-street parking in this area would have to be curtailed. This is where parking for local residents is already extremely difficult, particularly when large numbers of non-resident guests for functions such as wedding receptions, etc. attend the hotel and use the on street parking. 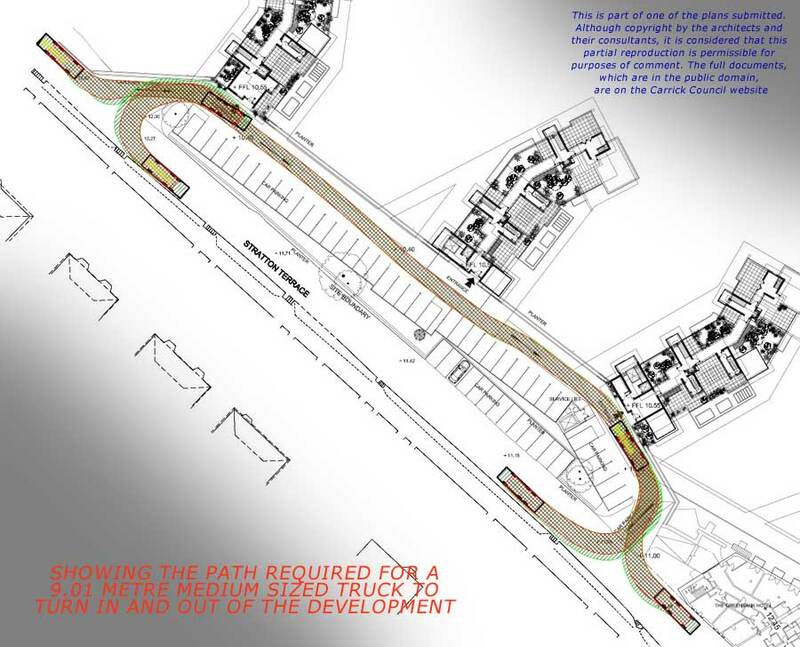 The plan above shows the tightest turn a 9.01 metre 'medium rubbish truck' could take leaving the proposed development. This is not actually that large a vehicle, the maximum sizes of ordinary rigid trucks being 12 metres, with 16.5 metres for an articulated vehicle. 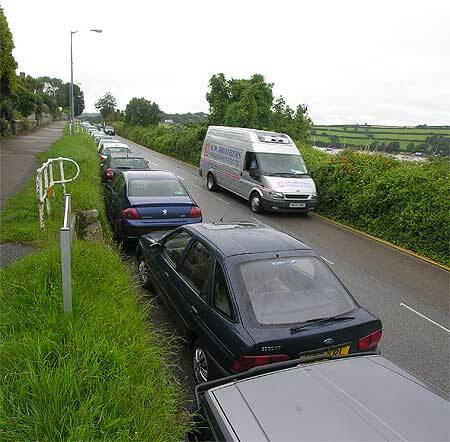 It is clear from the plan that if larger vehicles are to be able to leave the development without going through Falmouth Town centre , it will be necessary to put more double yellow lines on Stratton Terrace. Even then, really large vehicles will still probably have to go via the town centre. Coaches are often longer than the 9.01 metre rubbish truck shown on this plan! 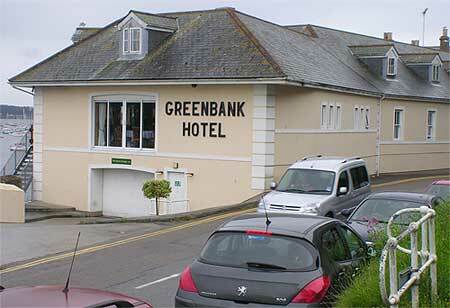 The same architect was again quoted in the West Briton newspaper in November, following a public meeting organised by Falmouth residents, as saying "...Traffic and parking is a problem currently and will be improved by more than doubling the current parking arrangements"
A 1989 planning application by the Greenbank Hotel to build an extension to the hotel (seen in this photo at right) was approved subject to the construction of a car parking area . The planning permission stated " ...the said parking spaces shall not thereafter be obstructed or used for any other purpose". Since around 1999 this car parking area, built as part of the hotel extension, has been used virtually exclusively for hotel furniture and catering storage, and is normally kept locked. Above - the undercover car park that was supposed to "....not thereafter be obstructed or used for any other purpose" seen on 15th August 2008 during Falmouth Week, in prime holiday season, when large numbers of additional visitors come to the town and put extreme pressure on parking. Photographs at right and below of parking on Stratton Terrace on the same day- 15th August 2008 - although this is a particularly busy period you can see the same pressure on parking on almost any day of the year. Virtually all residents of these streets have no off-street parking.